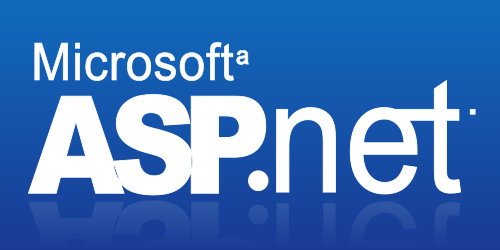 Microsoft first developed ASP.NET (formerly called ASP+) and the .NET Framework in 2000. The first version of the .NET Framework released in 2002 and was named as .NET Framework 1.0. Microsoft announced .NET Core in 2014 in an effort to include cross-platform support for .NET Framework. The .NET Framework has gone through several iterations and updates over the years, and has come a long way since its release. It is currently in its version 4.7.2, with the version 4.8 in the developing stage and schedule for a release somewhere around next year. The main advantage of the .NET Framework is its unified environment. ASP.NET is the main tool in the .NET Framework used for building dynamic web pages and websites using .NET languages. For years, developers have been using .NET (pronounced as DOT NET) framework to create, run and deploy desktop applications and server based applications. Developed by Microsoft, NET framework runs primarily on Microsoft Windows platform. ASP.NET is a web application framework which is part of the .NET framework based on an object-oriented and event-driven programming model to the world of Web development. ASP.NET is a great tool for building websites which can dramatically simplify the structure and creation of web applications. One of its biggest selling points is its flexibility and object-oriented features which makes ASP.NET an ideal choice for developing .NET Application development. The Net Framework (pronounced as dot net) is a software development framework that integrates a number of technologies emerged from Microsoft during the late 1990s to create, run, and deploy a wide range of web services and web and Windows applications. It is a framework for managed code and assemblies that simplifies the development of robust client/server and multi-tier applications. Because of its flexibility, it allows the development of scalable enterprise and business applications without writing code to manage transaction, pooling, or security. The ASP.NET is a part of .NET Framework used to create dynamic web pages. It is the next stage in the evolution of Microsoft’s server-side technologies and the successor to the classic ASP. It is fully integrated with the .NET Framework that simplifies the tasks of developing, debugging, and deploying web applications. The ASP.NET applications have full unrestricted access to all of the .NET classes and features. The applications are largely component-based and are built on top of the common language runtime (CLR) and can be written in any of the languages compliant with .NET. NET Framework (pronounced as dot net) is a development framework that provides programming guidelines and programming interface to Windows services and APIs. It is a software development platform developed by Microsoft to create, run and deploy a wide range of applications from web to mobile to Windows-based applications. The main strategy of .NET is to enable software as a service, but it’s more than that. ASP.NET, on the other hand, is the main tool in the .NET Framework that plays a key role in the Microsoft’s .NET strategy. ASP.NET simplifies the tasks of creating, debugging and deploying web applications. The .NET Framework is a managed environment and a revolutionary platform used to create, run, and deploy applications and services that use .NET technologies and CLR is the core runtime engine that monitors the execution of .NET applications. It is basically a development and runtime infrastructure that changes the development of business applications on the Windows platform. The architecture of ASP.NET is based on the following key components: Language, Library, and Common Language Runtime (CLR). The ASP.NET applications are largely component-based and modularized. Previously, .NET could be used only for Windows and PC users, but now provides a new programming interface to Windows services and APIs and integrates a number of technologies to develop a wide range of applications from Windows-based applications to web and mobile applications. It simplifies the development of robust client/server and multi-tier applications. ASP.NET, on the other hand, is a web application part of .NET Framework used to create websites that are data-driven and dynamic, that scale well, and that work well across a broad range of websites without any custom coding by the developer. The .NET Framework works with a set of programming languages including C#, C++, VB.NET, J#, and F#; and a set of development tools including Visual Studio; and a comprehensive class library for building web services and web and Windows applications. These components collectively form the largest part of the .NET Framework. ASP.NET is fully integrated with the .NET Framework and the Visual Studio. Its applications are built on top of a software environment called as Common Language Runtime (CLR) and any of the .NET languages can be used to write ASP.NET web applications. In a nutshell, the .NET Framework is a software framework developed by Microsoft to create, run and deploy desktop applications and server based applications, whereas ASP.NET is the extension of the ASP which is part of the .NET Framework that simplifies the structure and creation of web applications. One of the biggest advantages of ASP.NET is its flexibility and object-oriented features. The ASP.NET applications are built on top of the CLR and can be written in any of the .NET compliant languages. In simple terms, ASP.NET is a software framework that allows you to use the. NET platform and its supporting languages to develop web applications. Sagar Khillar. 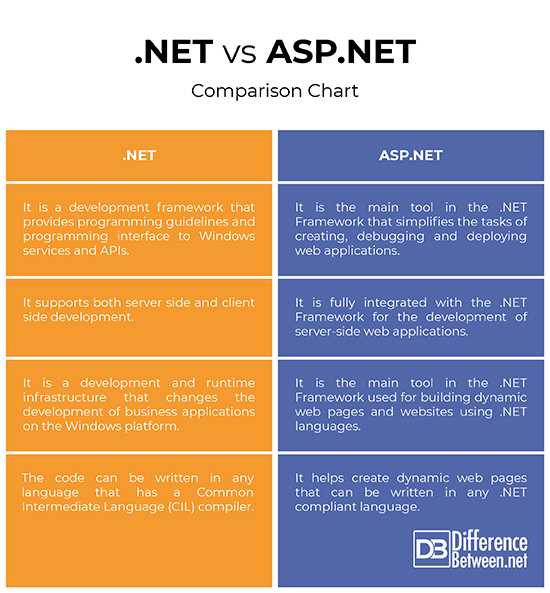 "Difference Between .NET and ASP.NET." DifferenceBetween.net. September 25, 2018 < http://www.differencebetween.net/technology/difference-between-net-and-asp-net/ >.